Infrared receiver with comparator for amplification. The 1 kΩ and 10 kΩ resistors are in a voltage divider configuration to generate a 3.0 V reference against which the input is compared. If the input is higher than 3.0 V, the comparator outputs 3.3 V, and otherwise the comparator outputs 0 V.
'U' character sent at 19200 bps over infrared with comparator amplifier. I figured I could put an OPA2134 op-amp voltage follower in between the external transistors and the comparator. This would de-couple the two sets of transistors, so the weird transistor chaining effect would disappear. This worked perfectly, once, for no apparent reason at all. Eventually, after spending a day trying to reproduce my success, I read the op-amp’s datasheet more closely and discovered that it’s not rail-to-rail and should never have worked (it can’t output the full 3.3 V signal, so the comparator’s input was never reaching 3.0 V). 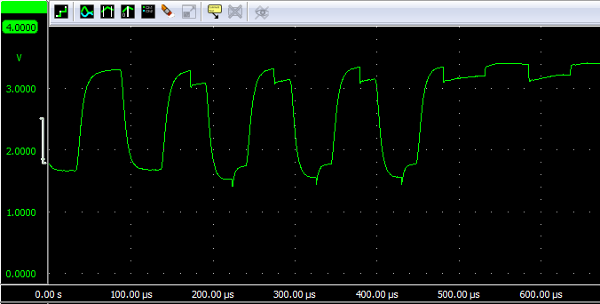 'U' sent at 19200 bps over infrared with JFET voltage follower at 7.5 cm. 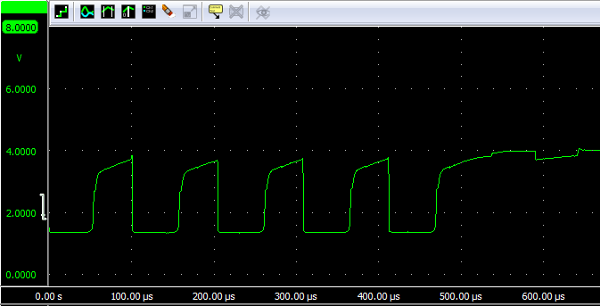 'U' sent at 19200 bps over infrared with JFET voltage follower at 2 cm. The signal is peaking at almost 4 V.
It’s sending 9 bits at 7.5 cm and 19 bits at 2 cm. Hoo boy, it didn’t work at all, and it was pure luck that the ‘U’ transmitted correctly at short range (followed, presumably, by a framing error that my system silently ignored). No other character worked. 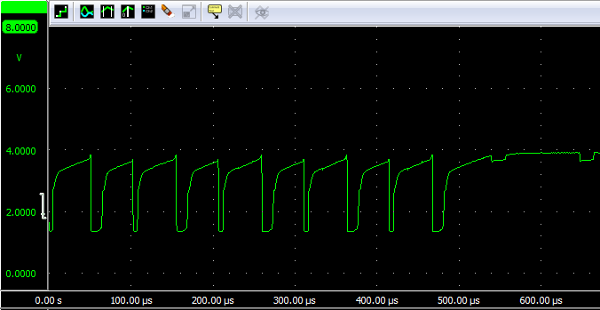 'U' sent at 19200 bps over infrared with op-amp comparator. Okay! 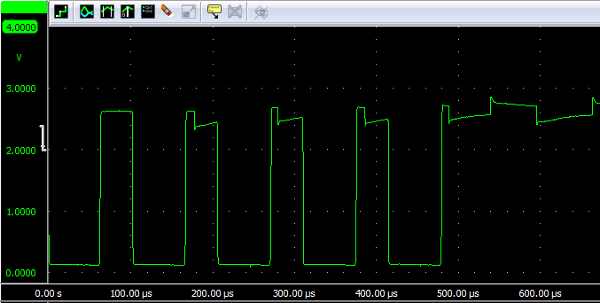 You can see what it means that the amplifier is not rail-to-rail, it’s only going up to 2.6 V (and that only briefly), but if I remember correctly it received. Unfortunately the high bits got narrower for some reason as the range decreased, so it didn’t actually do anything to solve the range problem. I tried using the JFET amp as a comparator, but it didn’t output anything at all so I gave up and ignored the project for a few weeks. My current solution is to pretend there isn’t a problem, and if I run into the minimum range issue then I can just bend the receiver askew so that the signal is damped enough to receive. In the meantime, the transmitter now has a wider field of view, which ought to make it easier to place several receivers in range of the control unit.